The crowfunding campaign on Ulule ended on November 28th. With 673 supporters, we raised 24345 EUR. Of those, 14935 EUR have been put in the liberation fund and the rest corresponds to the various pre-orders and rewards offered. This means that the translation will happen (we just started) but that the book is currently not going to be released under a free license. Don't despair... As planned, the liberation campaign is carried on until the 25 K€ target is reached! 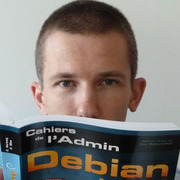 Instead of being hosted on Ulule, this permanent campaign is on the project website at debian-handbook.info/liberation/. Note that any contribution of 10 EUR or more means that you get a copy of the ebook as soon as it's available (even if the liberation target is not reached). If you have friends that were late to participate in the Ulule campaign, please point them to this ongoing liberation campaign. Thank you!